Researchers have conducted numerous animal sentinel studies to monitor the occurrence and spread of Lyme disease. “These studies primarily focused on ticks and associated pathogens collected from domestic dogs because of their ability to produce antibodies to B. burgdorferi, attainable travel history information, and frequency of outdoor exposure,” says Hendricks. Hendricks’ team looked at confirmed Lyme disease cases and ticks submitted by 62 veterinarian practices to the West Virginia State Health Department between 2014-2016. They found, 1,305 Ixodes Scapularis ticks were removed from dogs, compared with 363 from cats. 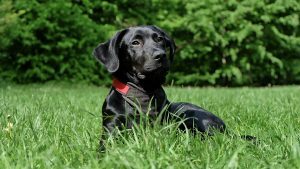 The authors concluded that only dogs were effective sentinel populations for monitoring risks of human exposure to Lyme disease. Tracking ticks in West Virginia using man’s best friend is more important than ever now that West Virginia has lost its status as a low incidence state. Hendricks B, Mark-Carew M, Conley J. Evaluating the utility of companion animal tick surveillance practices for monitoring spread and occurrence of human Lyme disease in West Virginia, 2014-2016. Geospat Health. 2017;12(2):582. No Replies to "Tracking ticks in West Virginia using man’s best friend"